Has your Xbox 360 ever started flashing red lights around the power button and cease to work? Commonly referred to as the "three red rings of death" or 3rrod, rod, 3 red light, 3rlod, etc they can encompass a wide range of hardware failures each indicated by unique secondary error codes such as e74, 0013, 0012, 0011, 0001, 0020, 0021, 0022, 0100, 0102, 0103, 0110, and other less common errors. Sometimes the unit will suffer from no video, freezing video, showing artifacts, or other graphical errors. These are just red light errors that the unit has not yet detected. Many of the problems are originated by the GPU since it produces the most heat, but other components can be affected as well such as the CPU, RAM, HANA/ANA, Southbridge etc. 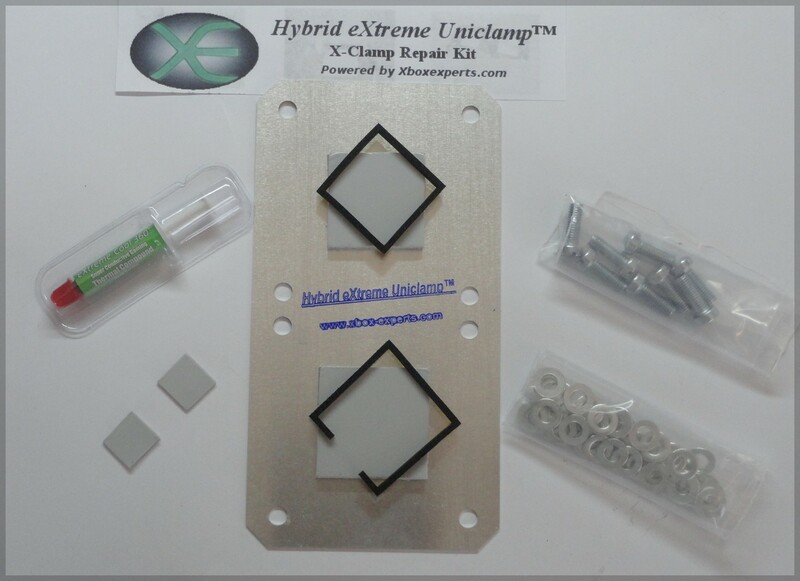 The Hybrid eXtreme Uniclamp™ kits were designed by xbox-experts to help prevent or eliminate most known factors which lead to the red rings....overheating, poor solder connections caused by board flexing from the chassis design and x-clamp retention setup. They provide better pressure to the chips, holding the connections in place while eliminating board flexing. Heat is drawn away from the underside of the board into the chassis via thermal pads. Works best when used as a preventative measure before the red ring errors start in the first place. Core temp drops around 6C are possible as well as keeping the motherboard near room temp. Cools almost as much as the 12v fan mod, but without the noise. Metric screws are only used to ensure proper threading since imperial size threads are slightly off which leads to stress on the heatsink and motherboard. Only steel washers are used since the OEM mounting hardware was all metal, so there is no worry of a short and no need for plastic washers. Most 3 red light errors can be easily repaired just by installing the kit, although a few bad ones will need to be reflowed or reballed as well (usually ones with failed fix-it attempts in the past). Hybrid eXtreme Uniclamp™ xbox 360 backplate developed exclusively by xbox-experts for the "extreme" version of "Team HYBRID's Ultimate X-clamp Fix". World's best X-clamp hardware replacement available and ensures proper installation/support of the motherboard and heatsinks. Thermal Pads under the heat sources (cpu/gpu) transfer heat to the Uniclamp made from the most heat conductive alloy of aluminum available. The heat then is then radiated off into the metal chassis of the xbox 360, essentially turning the entire chassis into a passive heatsink! The Uniclamp and thermal pads create a sandwich effect with the heatsink/shims from above, providing counter pressure and support from below which prevents board flexing. Designed to work in tandem with the metal chassis to secure the motherboard in a flat position and prevent further flexing. Made from thermally conductive non-toxic silicone based material which was was selected after months of testing materials from several manufacturers around the world. They provide the perfect density needed to counter the pressure from the heatsink. Pads on the uniclamp help cool the cpu/gpu chips and two smaller pads are used to fill the tiny air gap between the ram and gpu heatsink. High quality 3m thermal adhesive is used to ensure the pads stay in the correct position and don't fall off. No compromises on cost, simply the best quality thermal pad material available. Made from high quality rubber infused/fiber reinforced closed-cell foam composite material that provides the correct pressure and stability. Ensures proper parallel heatsink alignment with the chips. Protects the dies from cracking due to excess pressure. Extends pressure from the heatsink over the entire bga chip helping to hold the solder balls in place by preventing lifting/warping at the corners of the chips caused by uneven pressure and several heat/cooling cycles. High quality adhesive layer holds them in place. Over 1/3 gram of extreme thermal conductive pure Nano-Carbon compounds per syringe blended in a base of other nanometer sized metal oxide particles (silver/aluminum/boron/zinc) and small amount of organosiloxane compounds for ultimate stability and thermal conductance. Low bleed, non-flowing and low evaporation mean it will not run all over the place or dry out over time. Very easy to install and spread out over chips and cleans up easy compared to many other brands. Extreme operating temperature range....stable from -55~300°C without degradation in performance. Very high Dielectric constant, it will not short out components...can withstand above 10,000 volts without causing a short! Hybrid eXtreme Uniclamp™ backplate with eXtreme-Cool 360™ Thermal Pads for CPU/GPU.